Six Degrees | Planned Obsolescence: Conspiracy or Cultural Trend? Planned Obsolescence: Conspiracy or Cultural Trend? 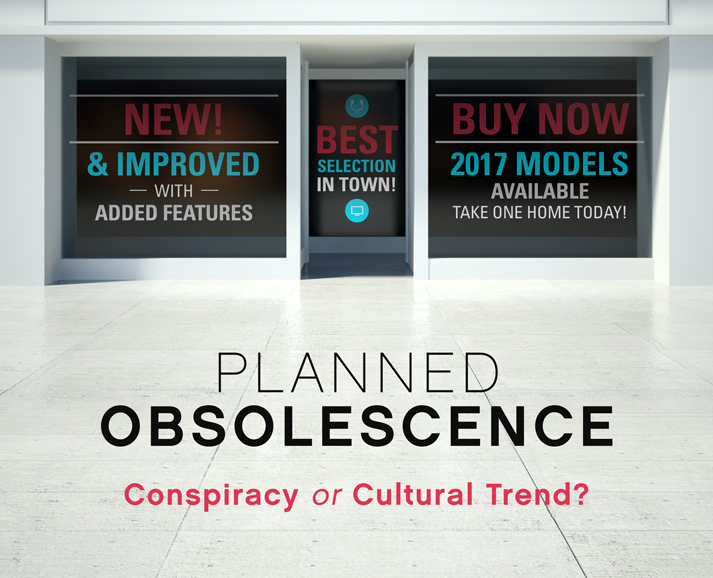 13 Apr Planned Obsolescence: Conspiracy or Cultural Trend? Every year there is a highly touted release of a new version of phone, car or something else. It seems every industry nowadays is pumping out something “newer” and “better.” So what happened to the idiom, “They don’t make ‘em like they used to”? The rise of new and more advanced products also comes with the frustration of what to do with the old product purchased less than a year ago. This raises a big question: Is this planned or perceived obsolescence? Meaning, are companies designing their products to fail at a given point (planned obsolescence), or have we as consumers become conditioned to ”need” the newest and best stuff? Based on the Phoebus cartel of the 1930s and the countless consumer lawsuits against tech companies, it can seem like this is just a conspiracy of all businesses trying to squeeze the last dollar out of consumers. Every new product seems to require a new dongle or some other accessory to work, and they never last like we expect them to. And if you try to replace or repair a part yourself, manufacturers make it difficult by requiring special tools to even access the components you need to replace. In his 1960 book “The Waste Makers,” Vance Packard describes three types of obsolescence. 1. Obsolescence of function: The product is inferior to other similar replacements. 2. Obsolescence of quality: The product will break down eventually. 3. Obsolescence of desirability: The product is less desirable than a more exciting product. Even though his book was written in the ‘60s, these three ideas of obsolescence remain relevant to this day. The launch of the iPhone thrust all the other phones into obsolescence of function – people wanted a smartphone instead of their older mobile phones. However, we are seeing less obsolescence of function and a greater increase in the number of products that fall under the obsolescence of quality and desirability. With desirability, a perfect example is the color of appliances and rise in the appeal of stainless steel over the traditional white or black. Consumers are replacing their old appliances with newer versions just because stainless steel is now more desirable, not necessarily because the older one stopped working. Going back to the example of mobile phones, it seems that there is not as much groundbreaking innovation today as there once was to warrant the purchase of an entirely new phone. However, we are seeing the issue of obsolescence of quality at work – eventually the product will not work as well as it used to. It might slow down, not support updates or not be compatible with new technology or add-ons. The idea of obsolescence of function is a great thing. It pushes companies to innovate and create new and great products. The obsolescence of quality is where the negativity comes into this topic of planned obsolescence. Why build something if it’s going to break? Because of the added pressure of companies having to bring a new or updated product to market every year to remain competitive in the marketplace, the level of innovation has skyrocketed. According to Philip Kotler, professor of marketing at Northwestern University, “Much so-called planned obsolescence is the working of the competitive and technological forces in a free society – forces that lead to ever-improving goods and services.” In other words, our globally competitive economy now drives competitors to seek market share – or just to hang on to their customers – by bringing innovation to the market as fast as possible. So are we as consumers willing participants or back-seat passengers here? There’s no denying that consumerism has become a part of our society with the increase in quick output of new products. We desire novelty and having the “best available” product the moment it comes out. While there is frustration toward how fast products seem to become obsolete, if you think about it, this has led to an age of huge innovation. I remember going from a cassette player to a CD player to an MP3 player in a short amount of time. It is truly shocking how much innovation and competition has come from our generation of consumerism. The so-called signs of planned obsolescence have better explanations than many consumers might think. Yes, software updates make a phone slower, but that is the unfortunate side effect of higher-quality software and improved features. This requires more processing power which older hardware does not have. Another is the expense of manufacturing. If companies expect consumers to upgrade in two years, why should they use more expensive parts when consumers plan on buying a new one anyway, regardless of its functionality? So what do you think? Is it planned or perceived obsolescence? Packard, V. (1960). The Waste Makers. New York: D. McKay Co.
Philip Kotler (2008). Retrieved March 13, 2017, from http://www.economist.com/node/12210481. MacKinnon, J.B. (2016). The L.E.D. Quandary: Why There’s No Such Thing as “Built to Last.” Retrieved March 13, 2017, from http://www.newyorker.com/business/currency/the-l-e-d-quandary-why-theres-no-such-thing-as-built-to-last. I think it’s probably a little of both–perceived and planned obsolescence. Very interesting point about companies not building things to last because they know that consumers will want to upgrade quickly. The trajectory of innovation is carrying us all along.